Heat oven to 375°F. Spray 12x8-inch (2-quart) glass baking dish with nonstick cooking spray. In large bowl, combine all casserole ingredients; mix well. Spoon evenly into sprayed baking dish. Spray sheet of foil with cooking spray; place, sprayed side down, over baking dish. Bake at 375°F. for 35 minutes. Meanwhile, in small bowl, combine topping ingredients; mix well. Uncover baking dish; sprinkle with topping. Bake an additional 25 to 35 minutes or until mixture is bubbly and top is golden brown. Garlic powder is ground dehydrated garlic flakes. 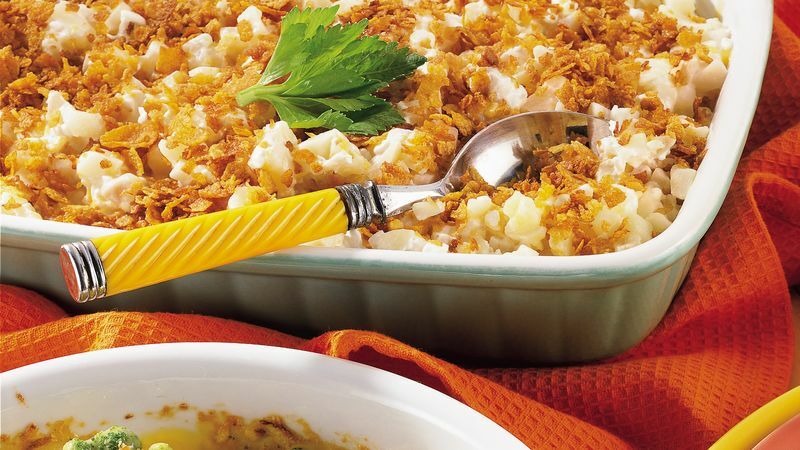 Frozen O'Brien potatoes can be used in place of the hash browns in this recipe. If you use O'Brien potatoes omit the instant minced onion. To separate potatoes which are frozen together, thaw them briefly in the microwave and separate them with a fork.